Between the hoopla surrounding Tesla’s new all-electric semi and a super-fast revamped Roadster, CEO Elon Musk spent a few minutes to muse about a pickup truck concept that resembles something like a Unimog that has the appearance of a toy. Musk hinted that a pickup concept was in the works earlier this year, but what is this? It’s something based on the semi’s platform—but who wants this? Where will it park? To illustrate the size of Musk’s concept of a truck, the sketch above was offered at last night’s presentation. It can haul an F-150 in its cargo bed. Why? Is Tesla vying for the I-want-a-Hummer-but-something-quiet market? Is that a market? “By the way, you will actually be able to drive that with a normal driver’s license. It’s kind of wrong, but I like it.” he added, which… uh? Maybe? I can’t give you specs. Other than I really can’t tell if Musk is serious about this. 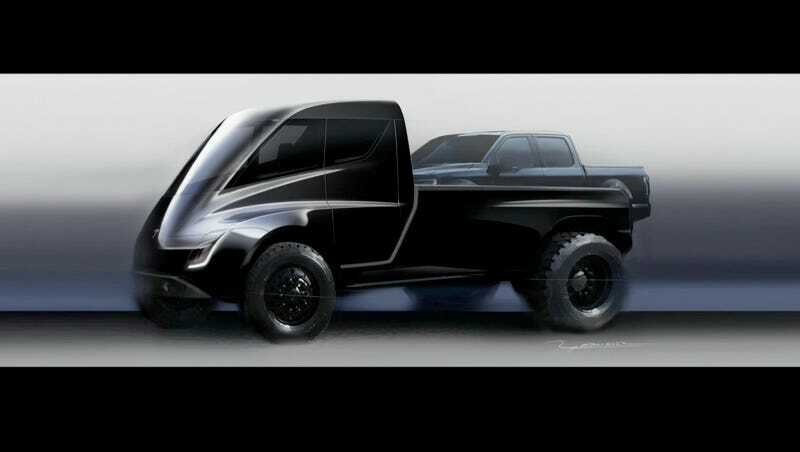 I think an electric pickup truck could be a smart move, just one that isn’t the size of a small house.